The target is hit with wings of steel. This may also raise the user’s Defense stat. The user stabs the target with sharpened stones from below. Critical hits land more easily. The user adds its HP to the target’s HP, then equally shares the combined HP with the target. The target is attacked with powdery scales blown by the wind. This may also raise all the user’s stats. A strong wind blows away the target’s barriers such as Reflect or Light Screen. This also lowers the target’s evasiveness. 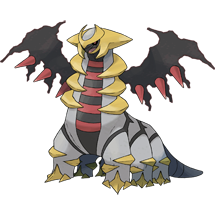 What do think about Giratina?